General MacArthur Returned as Promised - With Bags of Silver! Before General Douglas MacArthur left the Philippines in early World War II, he dumped every silver coin he could get his hands on into the Manila Bay in order to keep the Japanese from using them to buy weapons. When he returned as promised in 1944, the country was in desperate need of silver coins. 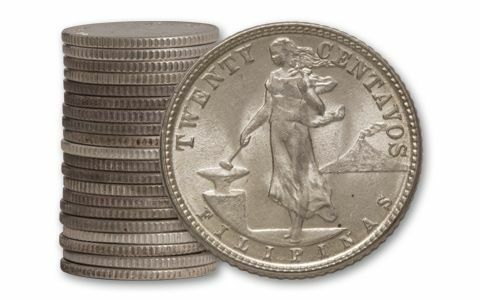 So, the Denver Mint came to the rescue, striking these twenty-Centavo silver coins and shipping them quickly to the islands. Look closely - you'll see an erupting volcano on one side! The coins saved the day and circulated heavily. Most were worn down to nothing. 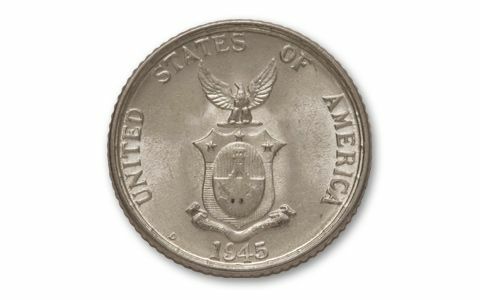 So, we were amazed to find a small hoard of these silver coins in Brilliant Uncirculated (BU) condition dated 1944 and 1945. The quality is truly amazing. 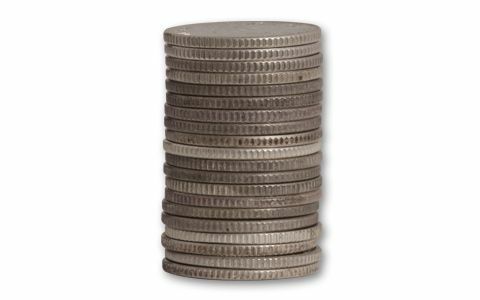 While our supply lasts, you can get them in 20-coin rolls. Don't miss General MacArthur's pocket change. You will be impressed.